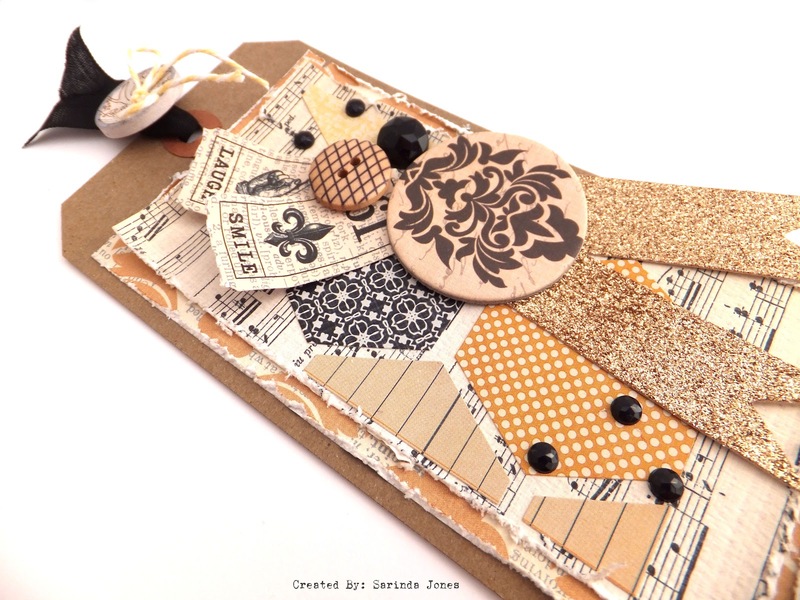 Sarinda has used two Teresa Collins collection to create a mini album and an artistic tag. The mini album below uses the Tell Your Story - I Want It All! 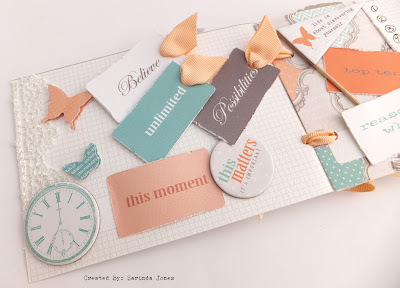 Full Collection Bundle and the Inspire tag uses the Vintage Find - I Want It All! Full Collection Bundle. 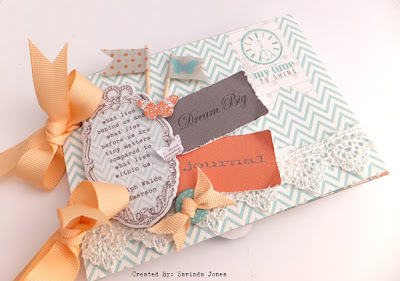 Find Large Journaling cards paper and cut out 4. Then arrange into the order that you would like your mini album. Punch two holes along left side about half inch from side. 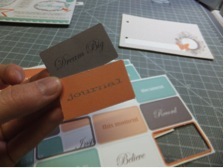 Find flashcard pack pull out Dream Big and Journal distress edges. 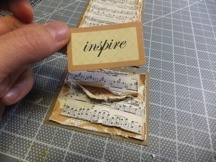 Locate Emerson quote on chipboard elements. Stage the elements on the cover of your album. Find Chipboard button add ribbon to the button then cut lace to the length of the album page. Make Flags with Decorative Tape. 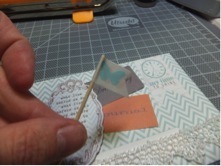 Wrap the tape onto the wooden dowel or toothpick then cut in flag shape. Stage the album page again. With all the elements as shown below. Once you have everything where you would like it start to glue down the pieces. 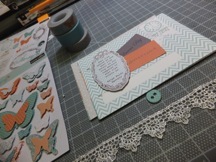 Starting with the lace. Locate two small butterflies from layed stickers add to right edge of quote. Congrats-! Your cover page is done. Flip cover over to do the second page. Find flashcards that say this moment, Believe, Unlimited, and Possibilities. 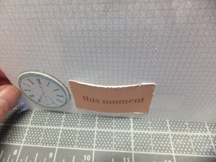 Find the clock in the chipboard elements as well the circle that says “this matters it’s important” Find the flashcard that says “this moment” add glue or tape to the two outside edges. 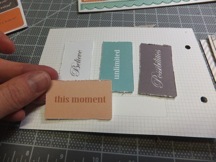 You are creating a pocket for the other flashcards to go into. Add the clock to the left. 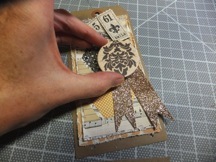 Add 2” of lace to the left edge of the page. 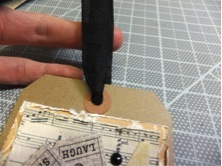 Punch holes in the Remaining flashcard then add ribbon then a dot of glue to the inside of the ribbon, press close. 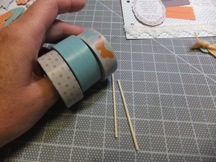 Cut the desired length then place into the pocket. 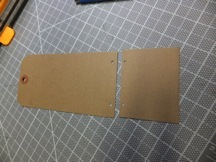 Locate the “This matters” chipboard piece place next to the pocket. 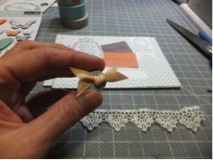 Add two butterflies to the right of the lace. Congrats-! Your second page is complete. 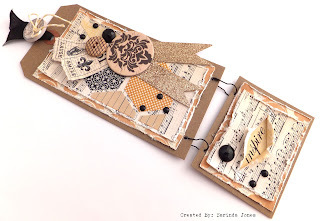 Find your second journaling card or third page. 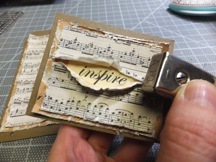 Take a wooden dowel or toothpick and add the banner from the chipboard elements “ Life is about discovering yourself”. Look for flashcards “top ten “and “reasons why”. Distress edges. 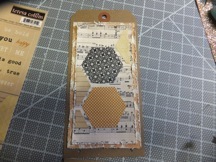 Find Journaling tag with the grid pattern cut to 2.5” x 3.5” Save the discarded piece for later. Distress edges and write 1-10 along the left side. This is to be used for the top 10 reasons why you should do what you love to do. Glue the elements to the page as shown below. Congrats-!! You have completed your 2nd & 3rd pages-!! 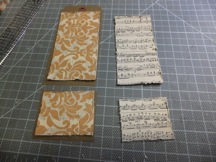 Add 5 strips of the decorative tape to the left side of page in a layered fashion, horizontally. 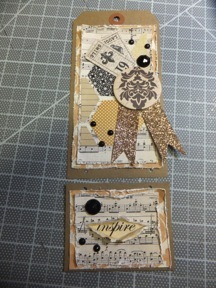 Locate the journaling card that you discarded in step 10, distress edges and glue on top of the layered tape. This is a great spot for a 3”x 3” photo or journaling. 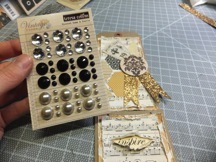 Locate journaling card with gray and white dot pattern. 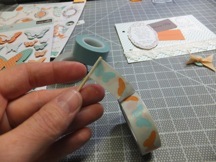 Add decoritive tape to the top of the page on the left to middle in vertical orientation. Find Flashcards: “Because, You are Special and Playful. Distress the edges. Find chipboard element that is an ornamental frame that matches image on page. 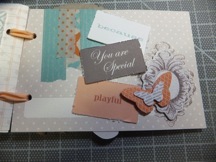 Place chipboard over image. Add flashcards layered on top of each other. 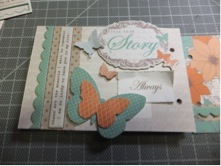 Find layered butterfly sticker place on top of chipboard element. Congrats-!! Pages 3 & 4 are complete-!!! Flip over page. 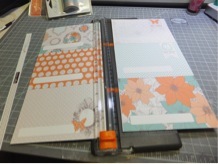 Place 2 stripes of orange dot decorative tape to the left of page about 1” from left edge. 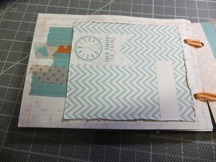 Find chipboard element scalloped green dot, place to left of tape and cut off excess, save for excess for next page. 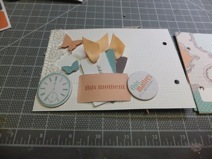 Locate the chipboard element quote “These are the moments I want to Remember….” Place on top of tape. 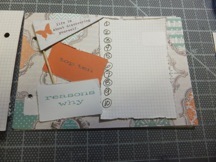 Locate “Tell your story” chipboard element place on top of page just over edge. 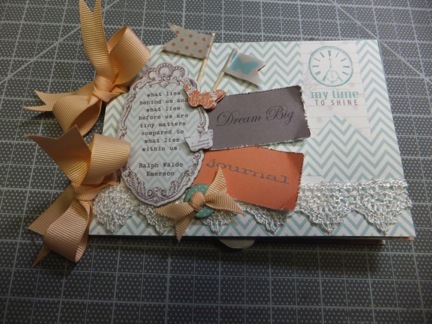 Locate flashcard “ Always” Distress edges and glue under the chipboard element “tell your story”. 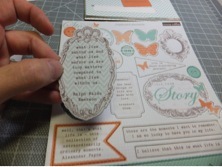 Find Layered Butterfly stickers and take large one place on lower half of page the 2 others just above like image below. Find floral journaling card. 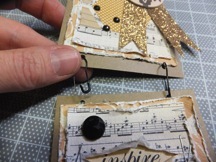 Use discarded scalloped green dot chipboard element place on the left bottom side of page. 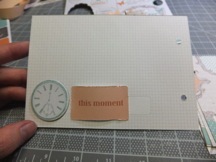 Locate the “Love this Moment” chipboard element circle place 1” from right side of page. 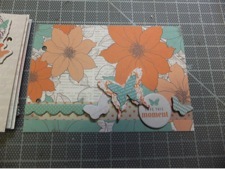 Then place 3 layered butterfly stickers to page as shown below. Another great page for an inspiring image. Congrats-!!! You have completed all your pages-! Now we need to put it all together. Stack all the pages on top of each other make sure the holes are lined up. 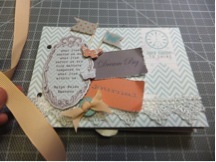 Take ribbon and thread through the top hole in all the pages. 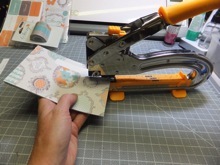 Punch holes into the bottom of full tag and the top of the cut tag, about .25” from edge. 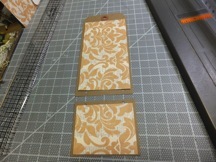 Cut 2.75” x 5.25” strip from Orange Damask Paper and also cut for small bottom tag 2.75” x 2.25” Distress edges. Glue to tag. 2.5” x 2” Distress edges. Glue to tag. 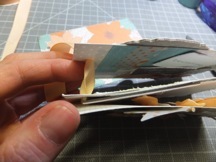 Then take the small bottom tag and rip in half Roll the inside edges of the paper, the ripped edge. 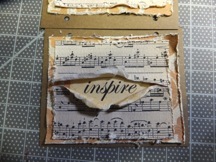 Find Inspire flashcard and place under ripped music paper. Glue in place. Then Staple the two edges. Find the sticker sheet. Find the honeycomb stickers. Black, orange small dot, yellow half, 2 line half. Place on upper half of tag like image below. Find the tickets 61 & 5. 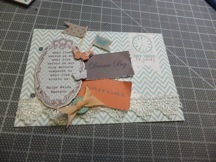 Then find the chipboard circle with damask design. 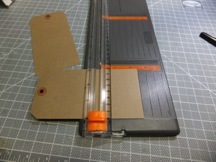 Assemble and glue like the image below. Find the black bling and place onto the tag like the image below. 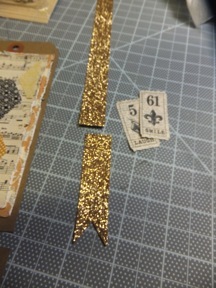 Add Safety pins to attach the two tags. Take the black ribbon cut approx. 4 inches thread it through the top hole of the tag. 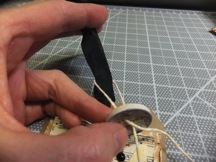 Find white leaf button add twine to the button like image below. Tie bow. 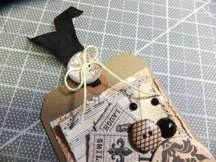 Find Crossed hatched button and add to tag next to large black bling.